A key part of transformation is improving how we communicate the value of public health and investments in primary prevention. To further develop this capacity, CALPHO and ECHO Colorado will be launching a communications Community of Practice. This launch will begin with a full-day, intensive workshop with FrameWorks in late spring. Participants will have guided practice during the session, then continue to develop their skills through Community of Practice Zoom sessions. Stay tuned for registration details! 2019 Public Health in the Rockies is back at Keystone this year with the theme "Equity and Social Justice: Innovation at Elevation." Come join hundreds of your public health friends for some high-altitude networking, professional development, and fun. Learn more and register here. We will be adding this to the website, business cards, t-shirts, and email signatures. Also, we will open every conversation with non-public health folks with the slogan. And through a generous grant, we have hired Morgan Freeman to repeat it 15 times with varying dramatic emphases for a statewide radio spot. We figure that'll get the message across. Stay tuned! Many thanks to the nine LPHAs who agreed to beta test one module of the transformation cost assessment tool this month. Once the testing is completed, Habile consulting will finalize the instrument, launch, and start data collection and technical assistance in mid-April. Habile Consulting will be presenting on the cost assessment at the April 18th CALPHO Transformation meeting. The cost assessment replaces CDPHE-OPPI’s annual survey this year. If you have some favorite metaphor that you have heard during transformation so far, please email us and share. Earlier this month, the Robert Wood Johnson Foundation (RWJF) announced the 12 communities selected as finalists for their annual Culture of Health prize. Lake County outshone 200 other applicants to make the cut. RWJF will announce the winner this fall. Learn more here. Congrats, Lake County! Dr. Nevin-Woods will join Larimer County Public Health and Environment as Medical Director, succeeding Dr. Adrienne LeBailly who held the post for over 30 years in addition to serving as director. Nevin-Woods is a familiar name in front-range public health, having served both Pueblo and El-Paso counties for many years. Congrats, Dr. Nevin-Woods! Lynette will start in her new position on April 1. Congrats and welcome, Lynette! The bill which allows local governments the authority to regulate products containing nicotine without a fiscal penalty (HB19-1033), was signed into law on March 27th. CALPHO’s lobbyist, Jennifer Miles, and staff, Shannon Kolman, were shoulder to shoulder with dozens of stakeholders, including partners from the Colorado Tobacco Free Alliance (CTFA) and the CDPHE tobacco program, at a signing ceremony in Governor Polis’ office at the Capitol on Thursday. Local governments may now regulate tobacco products, such as imposing fees, licenses or taxes (with the exception of implementing taxes on cigarettes) without losing their apportioned state tobacco tax revenue (share back). Many thanks to Jennifer Miles, CTFA lobbyists and Boulder LPHA/government reps who were instrumental in getting this important legislation signed into law! On another note, the bill to modernize the Colorado Clean Indoor Air Act (CCIAA) (HB19-1076), which would add e-cigarettes and vaping to the Act, and which CALPHO is actively supporting, sits in limbo while legislators in the House consider another bill, HB19-1230, which CALPHO opposes. HB19-1230 proposes to legalize marijuana hospitality spaces (e.g. clubs) in which marijuana may be consumed and allow such spaces to be exempt from the CCIAA. This bill was heard in the House Business Affairs and Labor Committee on Wednesday and passed 7-4 with an amendment proposed by CALPHO which would prohibit smoking or vaping of any tobacco products in a marijuana consumption establishment. Frontline Public Affairs will continue work to get HB19-1076 passed. This bill is not only vital to keeping indoor air clean from e-cigarettes and tobacco vaping, but will now also be key to prohibiting any tobacco use in marijuana consumption establishments. Earlier this week, HB19-1239, the Census Outreach Grant Program, was heard in the House Committee on State, Veterans, & Military Affairs. Advocates from a variety of sectors, including CALPHO Executive Director Tracy Anselmo, provided testimony Tuesday before the House State Affairs Committee. The bill authorizes and funds outreach grants to non-profits and local governments across Colorado to ensure a more accurate and complete count of people living in state. In addition to numerous federal funding streams that are census data driven, state and local funding and programming are often based on census data. If the billions of dollars lost in each committee members district, as called out by Representative Caraveo, were not enough to motivate a yes vote, several witnesses, including CALPHO, pointed out the reality that from agriculture to zoonotic disease prevention, an accurate census is at the center of all of our work. While there’s not much an LPHA can do to prevent the contamination attendees leave at a water park, Tri-County Health Department recently demonstrated how a quick, coordinated response can prevent potential mass illness. In June 2018, a power outage and subsequent repair was suspected to have allowed water from an irrigation pond to flow into the Water World potable water supply. This meant untreated water might have contaminated swimming pools, water features and drinking fountains, and may have been used to make ice, drinks and food at all concession stands, affecting nearly 14,000 people who visited the park during the contamination period. Tri-County Health Department immediately took action, bringing together key partners from Water World, Colorado Department of Public Health and Environment and many other county agencies to protect the public. They quickly closed the park, assessed the situation, implemented disease control measures and, once the park was safe, reopened it for business. As a result, there were no reported illnesses from the public. This course site hosts all of NACCHO’s training resources, including current and archived courses. Among their offerings are management topics, like Ethical Decision Making and Successful People Management, that are sometimes hard to find through other training resources. Check it out here. The National Association of Local Boards of Health is holding their annual conference in Denver this year, at the Embassy Suites Denver Downtown Convention Center. This year’s theme is Climb Every Mountain: Embracing the Challenges of Board Governance. CALPHO will be holding it’s monthly meeting at the conference on 8/16, and will be hosting a Colorado-specific BoH orientation as a pre-conference session on 8/14. Learn more and register here. There are scholarships available for first-time attendees. Apply here by April 8. 2019 Leadership week in Washington DC brought together state and local health officials who took to the Hill and urged lawmakers to prioritize public health. 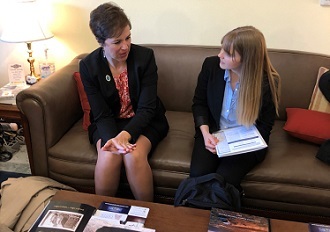 CALPHO Executive Director Tracy Anselmo and NACCHO board member and Rio Grande Public Health Director Emily Brown (pictured wihth NACCHO staffer Erin Laird) met with 5 congressional staffers to advocate for the public health priorities of Colorado LPHA’s. This included the 22 by 22, an advocacy campaign to increase CDC budget by 22% by 2022. For this 2019 - 2023 cycle, CDC is emphasizing that funds can be used for cross-cutting program development and not just discrete projects. Along these infrastructure lines, they have also prioritized the administration, management, and leadership capabilities necessary for any project implementation. Applications are due May 10. Lear more here. There is a longstanding narrative full of triumphant, linear progression on how civilization and states arose from our hunter and gatherer past (although not that far in the past for most places in the world). This book upends many parts of that narrative through a fascinating tour of the current archeological, biological, and historical evidence. Central to Scott’s explanations are the particular traits of grains and cereals. For instance, these crops’ easy storage, accounting, and predictable harvest made them a perfect basis for taxation and state control (usually for the purposes of acquiring and maintaining a slave-based workforce to harvest more and more grain). Scott’s work is full of similar insights. For a shorter exposure, check out this podcast. Part of the 2019 Public Health Week, CPHA and CSPH are hosting this collection of brief, 8-minute talks on a wide variety of public health advocacy topics. The 2019 Vector Summit will increase the capacity of local mosquito and tick management professionals to detect, prevent, prepare for, and respond to vector-borne disease. The Culture of Data (CoD) conference brings together community members, academia, state/local government and nonprofit organizations that share a goal of achieving health equity. This conference draws young people and adults who are engaged in creating connected communities and safe, healthy, and successful youth. One of two annual conference of county government leaders. PHIT will feature a series of hands-on, skill-building workshops, sessions, and networking opportunities in performance improvement. The 2019 theme for the NACCHO Annual is Improving the Nation’s Health Through Public and Private Partnerships. Early bird registration ends May 18. The 2019 National Association of Local Boards of Health Conference theme is ”Climb Every Mountain.” CALPHO will be holding it’s monthly meeting at the conference on 8/16, and will be hosting a CO specific BoH orientation as a pre-conference session on 8/14. This year's conference will focus on the balancing act that planners around the State must master. This summit will focus on navigating legal issues to collect, use, share and protect multi-sector data to improve the health of communities. The third annual All In National Meeting is designed to lift up the hard-won knowledge and practical lessons from these pioneering local data sharing initiatives to accelerate our progress toward improved health equity for all.